"I remember. I remember everything." That's a thrilling quote from Matt Damon in Jason Bourne, an excellent action-filled thriller that almost reaches the heights of the previous films. Damon reprises his role as Jason Bourne, who has recovered from his amnesia. He now takes part in illegal fighting rings. Nicky Parsons (played again by Julia Stiles) has been working with a hacktivist group in Reykjavík, trying to expose the CIA's black ops programs. 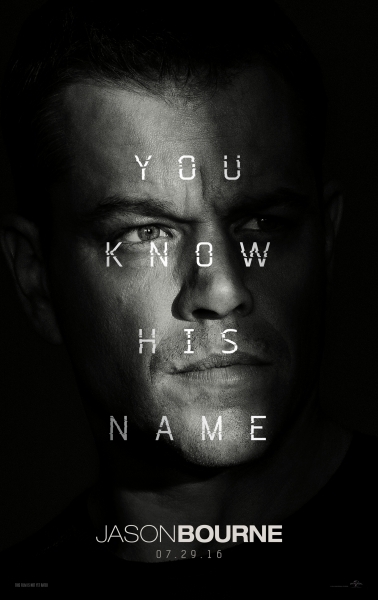 After finding information about Bourne's recruitment into the CIA & his father's involvement, she travels to Greece to find him, but not before her hacking activities are discovered by CIA Director Thomas Dewey (played by Tommy Lee Jones) & CIA Cyber Ops head Heather Lee (played by Alicia Vikander). The CIA then sends the Asset (played by Vincent Cassel) to go after Bourne & Parsons. After unforeseen circumstances, Bourne must travel alone to Berlin & London to find more information about why he was chosen & what his father's role in it was, eventually culminating in Las Vegas at a surveillance convention with Aaron Kalloor (played by Riz Ahmed), CEO of social media enterprise Deep Dream, which Dewey is using to create mass surveillance. Damon, Jones, Vikander, Cassel & Stiles give great performances. The direction from Paul Greengrass is great, along with the screenplay by Greengrass & Christopher Rouse. The editing from Rouse is excellent. Although it does fall below the previous films (except for The Bourne Legacy, which is on par with this film), it is still a great take on the current era of government surveillance, & keeps you wanting more of the Bourne franchise.